﻿ Catastrophism -End of the World, Rapture, Wrath of God, Final Judgment. Four examples by National Geographic. Analysis. The Hale-Bogg comet over Stonehange, England, in1997. Text accompanying the above photograph in “Photo News,” National Geographic online. 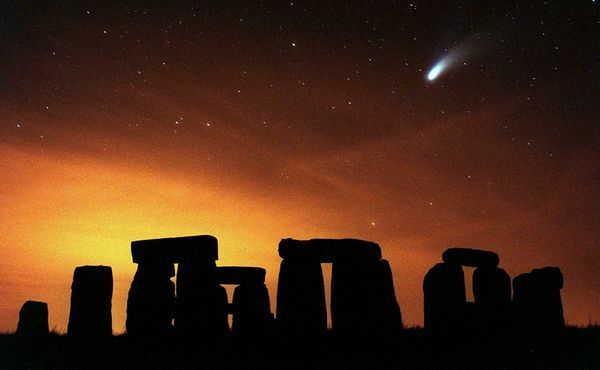 “Pictured over Stonehenge, the extremely bright comet Hale-Bopp, which was discovered in 1995, and sparked tragedy when it last buzzed Earth in 1997. Thirty-nine people, part of a religious group called Heaven's Gate, committed suicide in California when the comet was at its closest. The group believed that a UFO riding the comet's wake would rescue them from a doomed Earth. What a lamentable tragedy that of the thirty-nine who committed suicide! Because they mixed teachings and prophecies of the Bible, wrongly interpreted and applied, with UFO’s and comets. A Christian of mature understanding would never put together such a mixture, lethal, to be sure, for the soul. Esteemed editors and writers of National Geographic, do you pretend to discredit all Christians, including those who are really true to Christ but do not say or do strange things that would attract the attention of the media, by referring to sects, such as Heaven’s Gate, out there on the periphery of Christianity? That title “Hale-Boppalyse” we find very ingenious. There seems to be a subliminal intention, or maybe not so subliminal, to link the Hale-Bopp comet and the suicide of thirty-nine people in California with the Bible book of Revelation, or the Apocalypse. “Boppalyse;” Apocalypse. Who could miss it? But, if you had much correct knowledge of the Apocalypse, perhaps you would not be so bold as to imply, or forge, a connection bereft of reason and respect for truth. While it surely is so that countless religious sects –some of them rare indeed in their makeup, faith and practice; others, very fanatical, even violent- have arisen throughout the centuries of the Christian Age, or “Common Era” as lately it is called, the Author of the Bible is certainly not be blamed, for he is not the author of their errors. Nor are authentic Christians to be blamed, for they do not incorporate into their faith and practice damaging elements such as traditions, philosophies or esoteric postulations purely of human origin. I would not be surprised if you yourselves did not know even one of these Christians whose only creed is the New Testament, which they follow faithfully, without fanaticism or sensationalism. If that is the case, then, what a shame! And what a great injustice is committed by those who pass evil judgments on all Christians because of extremist sects or crazy-talking, self-appointed “prophets” who “speak a vision of their own heart, and not out of the mouth of the Lord” (Jeremiah 23:16). Tragedies such as that of the thirty-nine never occur within the heart of the church faithful to Christ, for the simple reason that those who make up its consecrated membership have sealed a very strong pact with themselves not to damage their own physical body, holding it in honor as the earthly dwelling place of the spiritual being that occupies it. Text accompanying the photograph in “Photo News,” National Geographic online. “When the Large Hadron Collider fired up in September 2009, some critics speculated that the world's biggest atom smasher could spawn a black hole that would mean the end of the world. A small group of physicists argued that there was a very, very remote chance that a black hole could be created, assume an odd orbit within Earth, and eat up microscopic chunks of matter until the entire planet was gone. This and other harrowing—and equally unlikely—scenarios prompted a couple of independent scientists to sue in spring 2008 to stop the atom smasher. Not all scientists in the world are atheists, as Stephen Hawkins proclaims himself to be, nor skeptics or evolutionists, and not all Christians in the world are hardened enemies of science. Of “science falsely so called” (1 Timothy 6:20), yes, many are, but not of genuine science. 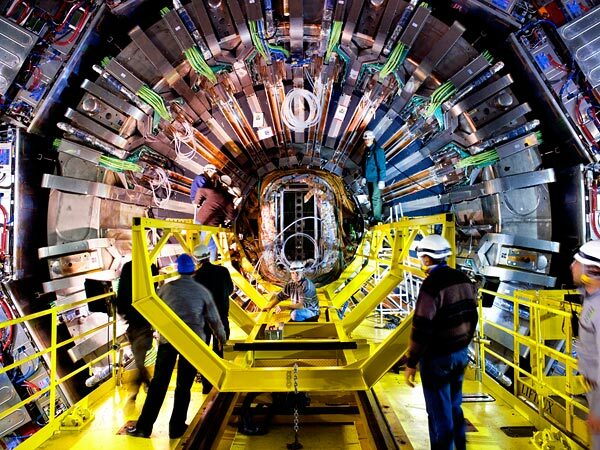 While some scientists mounted opposition to the Large Hadron Collider, I think that perhaps few Christians of mature understanding feared that enormous atom smasher could create conditions which would result in the disintegration of planet Earth. Because, contrary to a popular modern day thesis, the Bible does not teach the human race will end up destroying its own habitat. Quite the opposite: The Bible projection appears to be that humans will fight to the end to preserve their blue sphere in space, not destroying it completely themselves (Revelation 9:4, for example). Rather it will be destroyed by the One who created it originally, and not capriciously or because he is bad, but because the majority of our race is determined to destroy itself morally and spiritually, making its own self unworthy of occupying planet Earth. By the way, exactly what are the editors and writers of National Geographic determined to do? What is your true agenda? Would it be perhaps to undermine all faith in God, even faith that is intelligent and pure? To undermine completely the credibility of the Bible? And the very idea, as well, that human beings possess not only a physical nature but also a spiritual one? Do you promote only evolution and humanism? If this is your agenda, I will be so bold as to suggest that you yourselves contribute substantially to the creation of generations more and more lacking in natural dignity, decency, respect, love and other positive values that could save them from their own destructive weaknesses, vices and even criminal conduct. “Knowing that the Bible describes 666 as the ominous Number of the Beast, many Christian Europeans entered the year 1666 with trepidation. 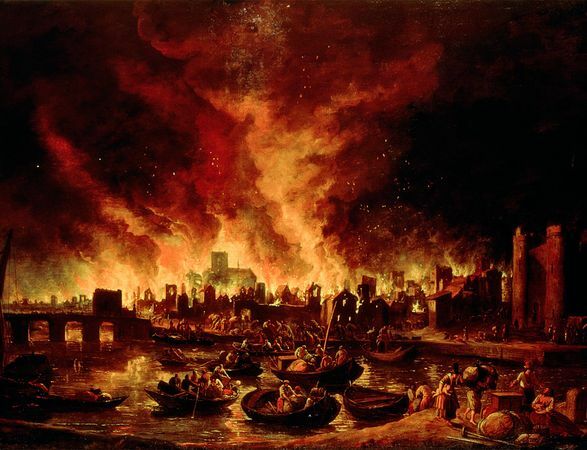 A prolonged plague that had wiped out much of London's populace in 1665 didn't help assuage fears, and when the Great Fire of London (pictured) occurred, many believed Judgment Day had come. It could be said the only thing many Christians understand about the number “666” is that, for them, it is an “ominous number.” The majority would not have the slightest idea of how to explain it in the context of Revelation 13. The same is applicable to the two beasts and the image of the beast described in the same chapter. The number 666 is “the number of the beast, for it is the number of a man.” It is the number of the “name” of the beast (Revelation 13:17-18), and thus is not the number of a year such as 1666 a. d. Elemental. But, through the centuries, how many men and women of the multitudes who have taken the name “Christian” have understood even the elemental teachings found in the Bible? Now then, distinguished editors and writers of the National Geographic, the ignorance or superstition of the London Christians of the XVII century, or of any other place or time of the Christian Age, does not mean that all Christians are equally ignorant and superstitious. Do you perchance have a complete and correct understanding of what the New Testament says about a great “apostasy” arising among the followers of Christ, invading his church after the death of the apostles? If you did have, you would understand that a very great amount of all that is disagreeable, offensive, superstitious, negative and downright immoral in Christianity today, including the sexual abuse of children by incontinent Roman Catholic priests, is the palpable fruit of the “apostasy” foretold in Bible texts such as 1 Timothy 4:1-5; 2 Timothy 3:1-9; 4:1-5; 2 Thessalonians 2:1-12; Acts 20:28-31 and various portions of Revelation. I would respectfully encourage you to take the time to read these texts, if for no other reason than, at least, to ensure that you yourselves not be found embarrassingly ignorant, albeit in part, when you take on religious subjects in your influential publications, printed or digital. A Christian of mature understanding does not exclaim “Sign of the end of the world! God’s wrath upon us!” every time some event such as the “Great Fire of London” takes place. Or, every time there are destructive earthquakes, hurricanes, tornados or floods. He knows these phenomena have occurred periodically since remote times and that they will continue to manifest themselves until the final working out of God’s plan for man and the universe. On the other hand, signs of another kind are of considerable concern to him, to wit, those of a moral-philosophical-spiritual nature. For example, the deterioration and loss of values which ennoble man. Human thinking and conduct on a precipitous slide into the depths of moral anarchy. Radical individualism. Hedonism. General approval of life styles and abnormal family arrangements that generate an endless number of social evils, as well as avoidable physical sickness. The mature Christian understands that signs of this nature indicate the approach of a period identified in the Bible as “the little time” (Revelation 20:1-10). He feels shaken in spirit when he realizes so many human beings are dead set on converting their personal liberties into outright licentiousness; their religious liberty into religious perversion or total spiritual indifference. These are the signs that fill him with foreboding presentiments of coming days much more difficult for humanity than most may care to think. Indeed, ironically, most interpret these “signs” as evidence of human progress toward a “better world of greater liberties and equalities,” where the basest can freely be as base as he wants to be, and little children are equal to adults. They shall see. We all shall see. 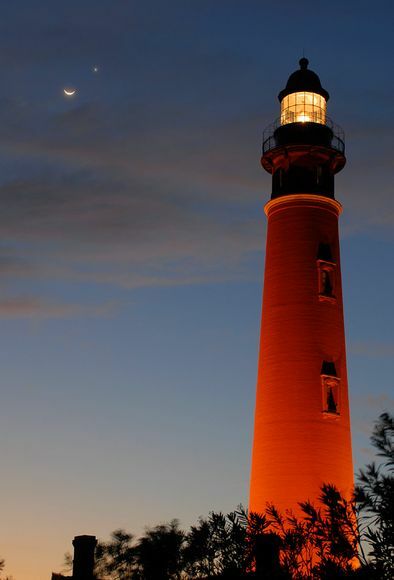 The moon and Venus join together in a conjunction over the Ponce Inlet Lighthouse in Florida, on February 27, 2009. “Such planetary alignments have inspired many doomsday forecasts, particularly around the May 5, 2000, conjunction, when Mercury, Venus, Mars, Jupiter, and Saturn lined up with the sun and the moon. Author Richard Noone predicted ice would overtake the world (see eighth photo) as a result of the alignment. And "psychic archaeologist" Jeffrey Goodman asserted in his 1977 book We Are the Earthquake Generation that "quakes and volcanoes [will be] set off around the world and a rift [will] open up as the Earth splits in several places to relieve the stress produced by the shift," New Scientist reported. But doom and gloom can also spark scientific innovation, as occurred in 1774 in Friesland, the Netherlands. A vicar hoping to boost his congregation circulated a "little book of doom" that said the solar system would be demolished during an upcoming conjunction, according to New Scientist. The Bible is definitely not a book of astrology. It does not teach or even imply anything about the supposed consequences of the conjunction of celestial bodies. Therefore, those of us who follow it closely are not alarmed when planets, the sun and the moon move into aligned positions as they circulate in their respective orbits. When such a convergence is about to happen, we do not make prophetical announcements. To be sure, we do not share the same sphere of spiritual communion with Richard Noone, Jeffrey Goodman and others of like mentality. If they say they are Christians, they dishonor Christ with their foolish predictions, making pronouncements about what they do not know and meddling in what they do not understand. Dear ladies and gentlemen of the National Geographic, New Scientist and other publications of the same nature, is it just, is it intellectually honest, to lump together in the same category all who invoke Christ, judging the most intelligent, mature and upright by the most scatter brained, infantile and hypocritical? The mature Christian does not belong to that lineage of ancient astrologers who assiduously studied the planets and stars with the purpose of making decisions or giving advice –political, military, financial, social (even on love), religious, spiritual- based on the relative positions of celestial bodies. He does not fall down on his knees before the spectacle of the heavens, believing the sun, the moon, the planets and the stars to be gods or goddesses. But, one thing he does do: He profoundly admires all his eyes behold in the spheres beyond planet Earth, holding it all to be the magnificent work of an extremely intelligent Creator Being able not only to conceive it but also to make it a reality. He fully identifies with the poetic affirmation of King David. “The heavens declare the glory of God, and the firmament sheweth his handywork” (Psalms 19:1). He is not all wrought up, trying to decide if the Creator Being made the universe employing the dynamics of a “big bang” or some other mechanism. For him, the heart of the matter is that it exists. To postulate its existence from the eternity of eternities, whatever its form might have been, not having produced or ordered it any intelligent being whatsoever, appears to him to be, by nature, an unsustainable thesis, since no human being could possibly prove it by empirical evidence, that is, through personal observation or absolutely verifiable facts. You will be wise, then, I think, not to dismiss so quickly, nonchalantly or disdainfully the world view of the mature Christian, for it would seem to be quite as meritorious of serious study as that of avowed evolutionists and atheists. The original source of the mature Christian’s world view is the Bible, particularly the New Testament, properly understood. What is the original source of your own world view, and how reliable is it?